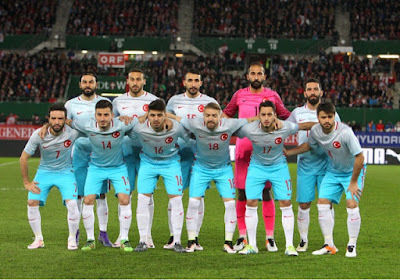 Turkish National team beat Austria 1-2 in Vienna , Tuesday night . Austrian midfielder Zlatko Junuzovic scored the first goal of the match in the 22nd minute when Turks made a huge mistake on defense covering the attack ! I think , he was the player of the match ,in this match ! The third was a lucky for Turkey and unlucky for Austria's keeper Ramazan Ozcan ..
Arda Turan flopped the ball into the net ! These two back to back wins in one week has been moral boosting for Terim and his boys ! The Turkish national football team will be hosted by Austria in a friendly match in Vienna on Tuesday . The match starts at 2.30, ET and will be broadcast live on ESPN3.com . Turkey and Austria, are both in the Euro 2016. Turkey are 20th in the FIFA rankings while Austria are 10th. Turkey recently beat Sweden 2-1 in a friendly match on March 24. Galatasaray defender Hakan Balta has been taking out from the Turkish squad as he was injured in the friendly. Austria has three Turkish origin players Besiktas midfielder Veli Kavlak, Red Bull Salzburg midfielder Yasin Pehlivan and Ingolstadt goalkeeper Ramazan Ozcan. Turkey won their last four matches and they are unbeaten in 12 matches in all formats ! Austria beat Turkey 2-0 in Vianna last time they met in 2012 . Austria National team won 9 and draw one in winning Euro qualifying group G ! Turkey beat Sweden with Cenk Tosun's two goals ! Thirt thousand fans filled Antalya' newly build stadium to support the National team. This was a morrel booster for the team before the Euro 2016 tournament this coming summer ..
Cenk Tosun scored two great goals one in the first half and one in the second half after Sweden tied the match ! At times he was in the middle directing the team from the middle . Keeper Volkan Babacan was good in the net for Turkey. After Hakan Balta was injured , young Ahmet Calik came in the game on defense. Terim even put Altinordu's young talent Caglar Söyüncü and another promising young star Yunus Malli from Germany in to the match for few minutes ! Turkey will play their second friendly match in Austria on March 29th . One of the is against England in England ! Turkey will play against Croatia, the Czech Republic and Spain in Group D in the Euro 2016 .